Characterized by built-in cabinets, exposed beams and cozy front porches, the Arts and Crafts style depends on handmade craftsmanship and naturalistic design. Choose simple plants with a natural form (i.e. waving fountain grass rather than clipped boxwoods), as well as real stone for pathways and garden borders. An old wooden bench tucked into a corner evokes the Craftsman feel. A quintessentially American style, Cape Cod homes typically feature a large central fireplace and upstairs dormer windows. Cottage plants like roses and hydrangeas – the bigger, the better – are classic plantings around Cape Cod-style homes. Finish off the look with a white picket fence, a brick or bluestone walk, wooden planters painted to match the shutters or in a weathered gray, and a wooden bench. Natural, sustainable materials, low-energy design and a connectedness between indoors and outdoors are hallmarks of this style. Contemporary homes can take either a modern, sculptural approach with clipped shrubs and geometric forms, or the opposite: a sustainable, low-water garden of natural plants like native meadow plants in the sunny spaces and moss in the shade. Federal-style homes are formal and rectangular, with symmetrical windows and subtly grand ornamentation such as a brick exterior and tall, slim porch columns. Clipped, straight, formal lines are appropriate in the garden of this home. Evergreens are key for this look, with topiaries and pockets of flowers. Red-tiled roofs, stucco finishes, arches and balconies give this style its signature charm. Clumps of palm trees provide a frame for the house, and the music of a water feature in a courtyard or backyard complements the style. Natural paving materials like stone or cobblestones in sun-kissed blonde and brown colors give the house an Old World look. Accent with terra-cotta containers and wrought-iron fences and gates. Clean, geometric lines, open living spaces and materials like concrete, steel and glass are hallmarks of this style. Minimal plantings show off the clean, modern lines. If the plantings are overdone, you might pare them down to keep the landscape as minimalistic as the home. Sculptures and bare planters make a statement, as well as concrete or gravel walkways. Basic and functional with small square footage and generally a kitchen window facing the backyard, this home is a blank slate for garden design. First, focus on that kitchen window and create a view from inside, and second, since your home probably looks like every other house on the block, use landscaping out front to create a distinctive look that's all your own. Earthy adobe walls, enclosed courtyards and rounded exteriors with square windows and heavy wood doors are signatures of this ancient home style. Lawns and plants that need plenty of water are not compatible with pueblo revival homes, which originated in the desert. Instead, plant masses of low-growing native plants –cactus and succulents in the Southwest; yuccas and native cactus in the East – and blanket them with gravel instead of grass. Finish the look with gravel or stone pathways and a shade structure like an arbor (called a ramada in the Southwest). A uniquely American style, ranchers are low-slung, single-floor, asymmetrical homes with garages front and center and a focus on backyard living. With its horizontal shape, ranch homes need smaller plants to match – especially in front of the windows. Larger foundation plants and trees can be used on either side of windows and near house corners. 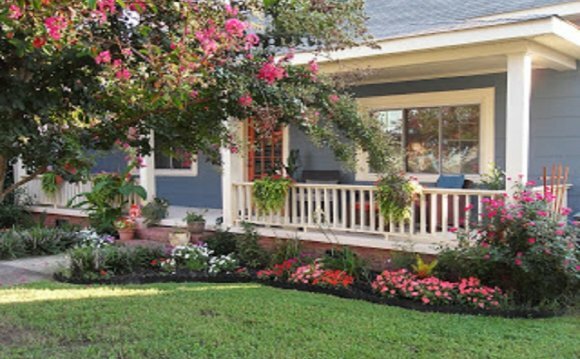 Accent the front door with medium-sized planters on either side. The backyard typically has a patio, large grassy area for play and comfortable outdoor furniture. Large and imposing, with elaborately decorative trim and vibrant colors, many Victorian homes have wings and bays, towers and wraparound porches. Typically raised off the ground, Victorian homes are practically designed for elaborate foundation plantings, although the garden needs to strike a balance between competing with the house and being too simple. Weeping willows, spiral evergreens and ivy are popular plants with this style. Accent with cast-iron benches, arbors and fencing.